I am interested in helping my school get solar panels on the roof to show students how we can be part of the solution to the climate crisis. Are there any resources or grants out there to help schools go solar? Putting solar panels on your school is a great idea, not only to provide a free source of electricity, but also as a realworld way to teach students about the need for more renewable energy options and to make the school community part of the solution to our climate woes. School buildings are typically built with large, flat rooftops that are ideal candidates for solar installations. 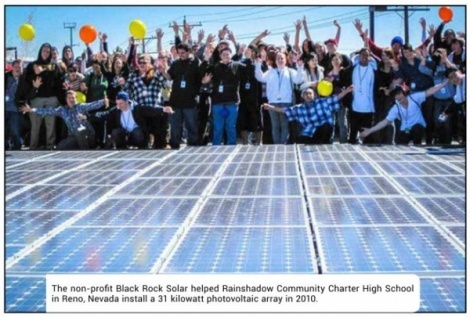 According to the Foundation for Environmental Education’s Solar School Initiative, some 4,000 public and private school systems around the country have already installed solar panels at their own expense, or with funds raised through parent-teacher associations, student groups, individual donors and foundations. Analysts estimate that an additional 125,000 schools nationwide are good candidates for going solar and reaping the financial benefits of free energy. Developing renewable alternatives is essential to our transition away from dirty fossil fuel sources. For more tips, check out the National Renewable Energy Laboratory’s report “Solar Schools Assessment and Implementation Project: Financing Options for Solar Installations on K-12 Schools,” which explains the myriad ways to finance and own solar installations at schools - including how to choose a location to maximize benefits. CONTACTS: Solar School Initiative, www.solarschools.org; ASES, www.ases.org; DOE Loan Programs Office, energy.gov/lpo/loan-programsoffice; American Electric Power Foundation, www.aep.com; NREL, www.nrel.gov.